When they originally appeared on Twitter, Twitter Moments were only for things of national or global importance. Stuff like celebrities making bad decisions, famous people tweeting foolishness (yes those first two are mostly the same, and yes they were still most of what moments were about), and also things like actual news (but only rarely). Recent changes made by Twitter allow you to create them. If you’re sharing your learning on Twitter (which you should be) and you’re not using moments (many people aren’t), you’re missing out. This post will tackle what are Twitter Moments can be used for, why should you care, and how do you make them. So, what’s a moment and why should I care? A moment is a collection of tweets that you can gather together in an easy to share format. Why is that useful? When so many educators are sharing their learning on Twitter, there is an ocean of greatness out there. It’s nice to put a few of the tweets that stand out to you in a single place for future reference and clean sharing at the moment. I had the privilege of attending EdCamp Navasota this weekend. It was fantastic. In a half day, I had so many conversations that challenged and supported me. It was amazing. I had the opportunity to facilitate a conversation on blogging during the second session. 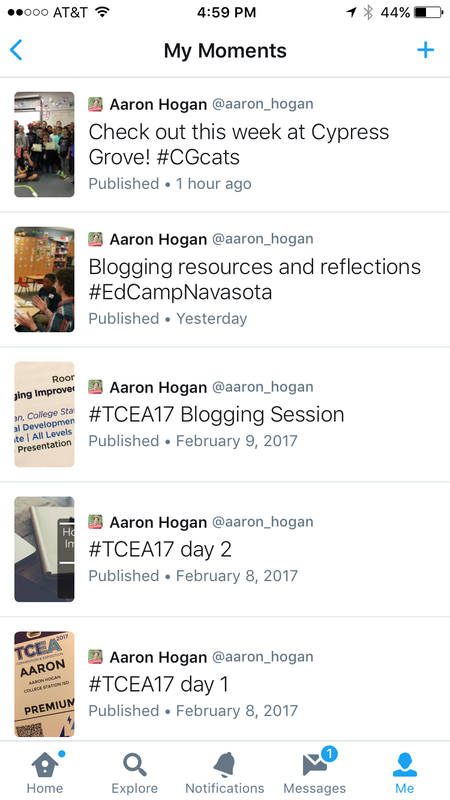 We shared resources, stories, and struggles throughout our time together, and at the end, I created a moment to pull a few of the tweets together before they got swept away in the sea of other tweets that included the #EdCampNavasota hashtag. It was great to have everything in one location for a quick share after the session, and I’m able to go back to those resources and pull from the intelligence of the entire room the next time someone asks me about blogging. I also used a moment to capture the tweets that were sent to my campus hashtag (#CGcats) last week. A couple of weeks ago I heard the simple but genius idea that’s made a big difference in our staff tweets: Instead of telling them why it’s so great to share, reflect, and connect and hope they’ll be intrinsically motivated, just let them wear jeans on Thursday if they tweet three times about what they’re learning of what’s happening in their classroom (Thanks to Matt Arend, Amber Teamann, and Sanee Bell’s collective genius for this!). We had a great response, but we have people at all levels of familiarity, excitement, and trepidation surrounding Twitter currently. 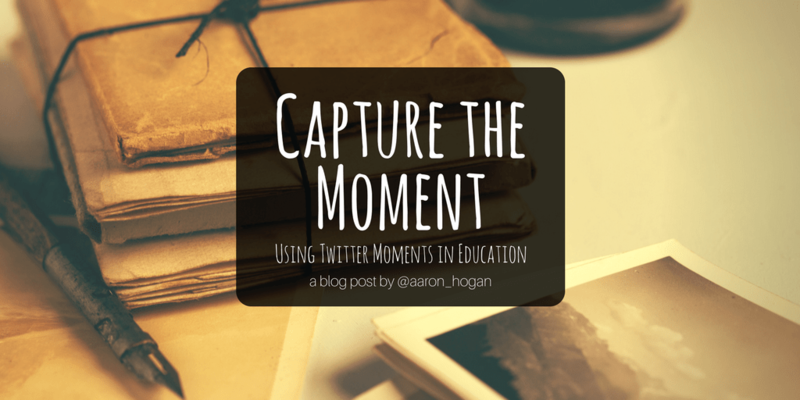 This Twitter Moment is something that allowed me to share the tweets to everyone on campus as well as my PLN. It’s great to have all this awesome from around our campus pulled together in one space, and I love that I can access this summary so easily in the future. 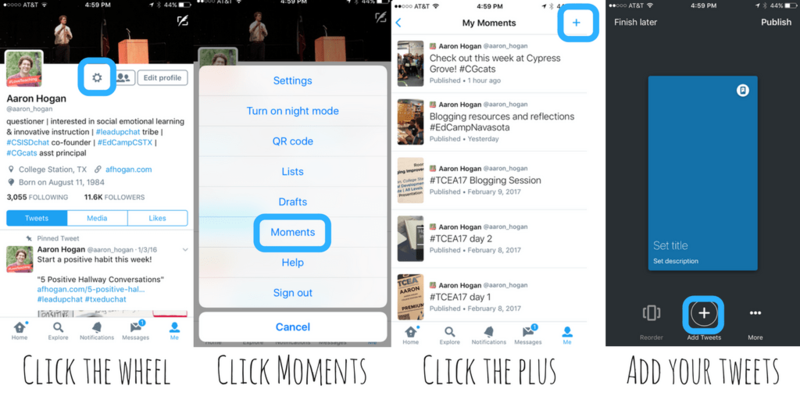 I also used moments to document big chunks of my experience at TCEA last week. Who hasn’t had that conference overload/exhaustion feeling before, right? It’s nice to be able to go back to those moments to reference all I learned in Austin over those three days. Here are links to those if you’re interested: TCEA Day 1, TCEA Day 2, & my blogging session. How do I make a Twitter Moment? First, click the wheel on your profile page. Then, click moments on the list that pops up. In the top right corner, click the plus to open a new moment. Add your tweets before clicking save and publish. Unlike a tweet, there’s no need to get everything perfect the first time. Moments are editable and can even be unpublished if you need. 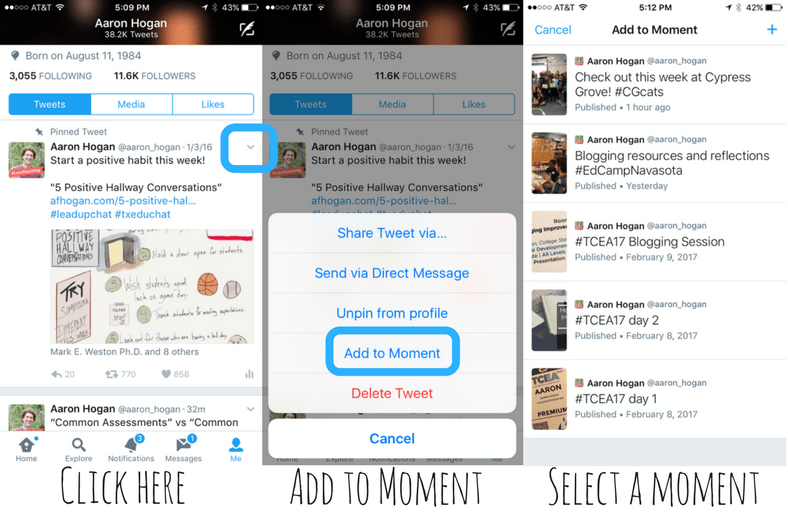 You can also add tweets by clicking the carrot, clicking add to moment, and selecting the moment to add it to. Think through this next week. What are those opportunities to capture a moment on Twitter? Will it be a Twitter chat? An event at school? An area of your learning where you know you’re growing? Something you’ve learned that you can pass along to a colleague? Whatever it might be, don’t miss out on the opportunity to capture and celebrate things worth sharing! Awesome! Glad the timing works out so well for you! Thank you Aaron for this post. I have to admit that I did not know about this feature in Twitter. I love it! You bet! I’m not really sure how I stumbled upon it, but I’m glad I did!